CLOSED - $220,000 above ask at $1,560,000. Move right into this Legal two family Townhouse on Hancock Street between Stuyvesant Avenue and Malcolm X Blvd. The owners have taken time and vision in making this north/south facing townhouse bright, open and welcoming. 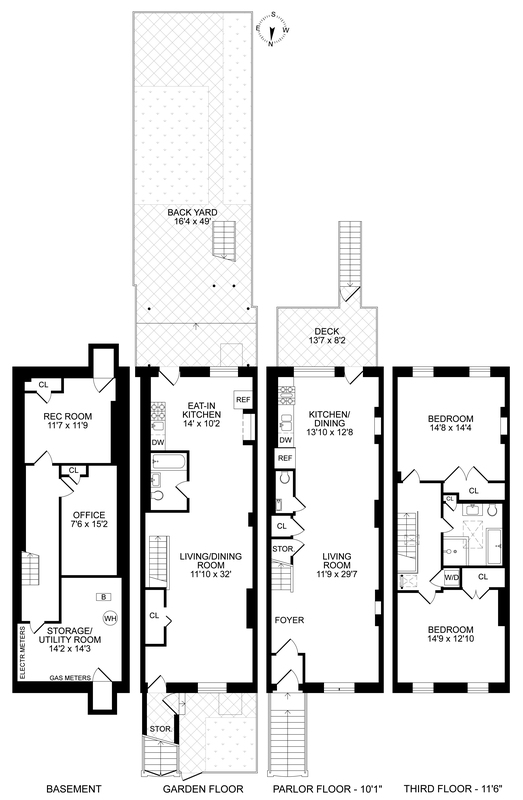 The second floor has 13 ft. Ceilings and contains two large bedrooms, W/D and a bathroom. The first rear facing bedroom has a non-working fireplace, hardwood floors and a wardrobe and is bright and airy. The Large oversized bathroom is tiled entirely in Italian Carrara tumbled honed tile. As well as a Duravit sink and soaking tub the bathroom has a has a skylight that affords ample light. The landing, railed with free standing glass has two skylights that add to the light, bright feel throughout the house. The second bedroom has two large windows, wardrobe, split dual system and is oversized.Garden unit. The garden unit is open plan and in excellent condition. It is currently rented out and at market rate could generate approx $2300 a month. Enjoy the new and established bar and restaurant scene including L'Antagoniste at the top of the block and Saragingha a block away. Also Bar Lunetico, Nana Ramen Bed-Stuy Fresh and Local. A short walk to A/C subway line, the B26 bus is a top of the block serving Bed-Stuy, Clinton Hill, Ft Greene and Downtown Brooklyn.Fully renovated and immaculately apportioned this townhouse is ready for you to move in and make it home.